This pair of gloves fits most adults and is just the right finishing touch for that Punk outfit. 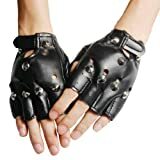 BLACK LEATHER LOOK FINGERLESS GLOVES FANCY DRESS. This entry was posted in Gothic Discount Clothing and tagged 80's, Biker, Black, Dress, Fancy, Faux, Fingerless, Gloves, Goth, Leather, Pointed, Studs by Vivid Dark. Bookmark the permalink.